During the 12th century, popular love for Mary inspired Europeans to begin using their paternoster beads to pray also to Mary, with what gradually evolved into the ‘Hail Mary’ that we pray today. 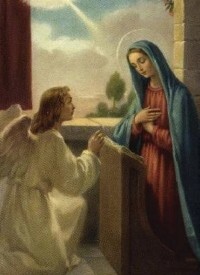 Originally, the prayer was simply the Angel Gabriel’s greeting to Mary - also known as the ‘Angelic Salutation’ - found in Luke 1:28: ‘Hail Mary, full of grace, the Lord is with thee’. Soon, Elizabeth’s greeting to Mary, found in Luke 1:42, was added: ‘Blessed art thou among women, and blessed is the fruit of thy womb’. Over time, phrases and meditations on miraculous events from the lives of Jesus and His mother were added to the ‘Hail Mary’s, and so this form of prayer became known as the ‘Psalter of Our Lady’, the ‘Marian Psalter', or the ‘Psalter of Jesus and Mary’. As the Marian Psalter came into being, what dramatic events were occurring in Europe to undermine Christianity? Continue with the History of the Christian Rosary.